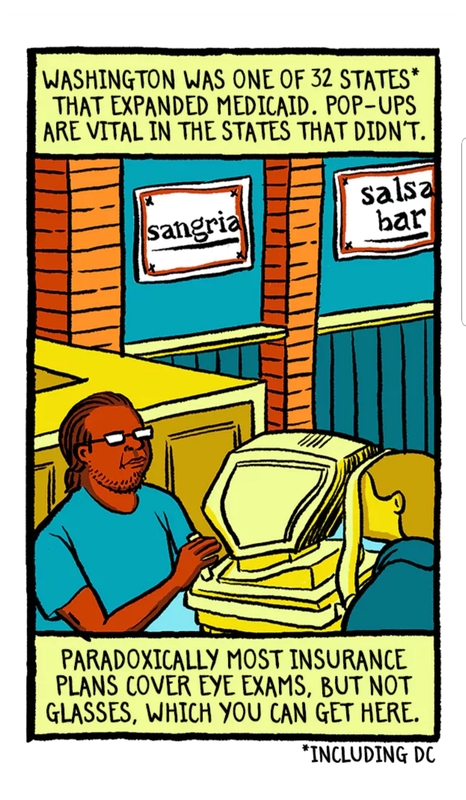 A panel from Eroyn Franklin’s web comic, “Can Free Pop-Up Clinics Save American Healthcare?” The comic is meant to be scrolled to read, and as such only one panel can be read at a time. Scott McCloud seemed a bit reluctant to predict definitively where the future of comics would be as a medium, as their definition is fairly broad and their potential great. However, I did read and consider two different forms of comics: those printed within a physical book, and those published online. I do not feel that either media is particularly better or worse than the other; rather, they both seem to have their own advantages and disadvantages. For example, the webcomics that I viewed were free and available to almost anyone with access to the Internet, while print books may need to be bought or borrowed from a library. However, I found the print book easier to read because I did not need to scroll; instead, my eyes were able to take in more of the panels at once. However, with this being said, I feel that with the popularity, speed, and convenience of the Internet, that digital comics that can be read online will outgrow print comics in most genres of comic. On the other hand there are some genres such as superhero comic books whose value is in part due to the fact that they are solely in print form and can be collected, so I feel that there will always be a place for print comics in popular culture. If I were going to create a comic, I think that I would envision it being read in a printed format, because it is what I found easiest to read and held my attention for the longest period of time.